Jimi Hendrix Portrait Made of 4,000 Guitar Picks! Home / Blog / Jimi Hendrix Portrait Made of 4,000 Guitar Picks! When the name “Ed Chapman” is involved in any work of art, you know it’s going to be a masterpiece. Britain’s leading mosaic artist impressed its audience again with another brilliant piece of mosaic for guitar legend Jimi Hendrix. 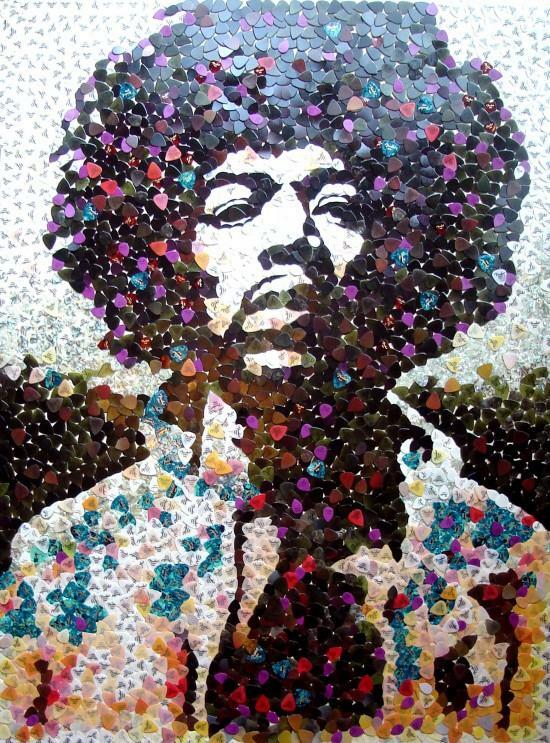 The portrait used more than 4,000 plectrums made by Fender, known to have been one of Hendrix’s favourite guitar brands. The creative twist Chapman brings to his works is strange to none. Portraits in penny coins and sugar cubes are also among his well-known mosaics that were exhibited all over the world. His previous works include mosaics of John Lennon, Eric Cantona, and ManU manager Alex Ferguson. In April 2012, his mosaic of Jimi Hendrix was auctioned during an event for Cancer Research UK for £23,000/$35000, one of the highest prices ever paid for a mosaic piece of art. Known for having reimagined mosaic art, Ed Chapman is called 'Ceramics King' and 'Mosaic Maestro' by his admirers.